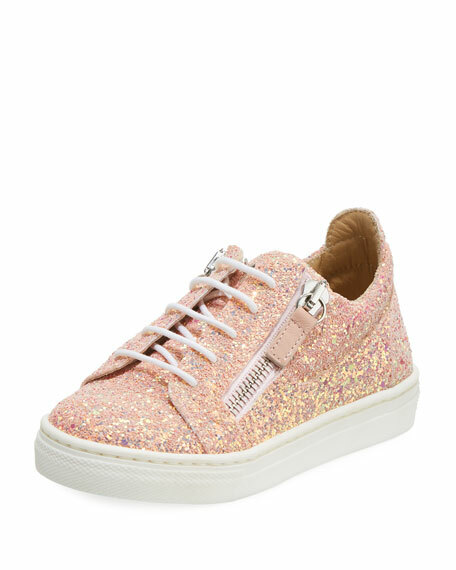 Giuseppe Zanotti "Mattglit" glittered leather low-top sneaker. Lace-up front with side zips. San Mauro Pascoli, a small village on Italy's Adriatic Riviera, is renowned for its fine cobblers. It's also the birthplace of designer Giuseppe Zanotti, whose collection of breathtakingly beautiful shoes also exhibits the quality craftsmanship worthy of his hometown's heritage. The Giuseppe Zanotti line debuted 1994, and since the beginning, the designer has included a jeweler, embroiderer, and heel expert on his staff. For in-store inquiries, use sku #2388575.